A classic steak recipe served with a brilliant béarnaise. This recipe comes from chef Simon Cottard – it has been on his restaurant menu for 30 years, need we say more? Start the béarnaise by clarifying the butter. Melt in a heavy-based pan over a low heat. Skim any solids off the surface and discard, then cool – the milk solids will settle at the bottom. Spoon off the yellow clarified butter into another heavy pan, leaving behind then discarding the white solids. Keep the clarified butter warm over a very low heat. Clean the original heavy-based pan, put the white wine vinegar, white wine and shallot in it, then bring to the boil. Bubble until reduced by three quarters, then set aside until just warm. Heat the oven to 220°C/fan 200°C/gas 7. Tip the shallot reduction into a heatproof glass or ceramic mixing bowl, add the egg yolks, then beat vigorously with a balloon whisk until foamy. Set over a pan of simmering water – the bowl shouldn’t touch the water. Whisk for 2-3 minutes until smooth, creamy and increased in volume. Remove the egg mixture from the heat. Pour the melted clarified butter into a jug or pouring bowl, then pour into the egg mixture a little at a time, whisking continuously. If the mixture becomes very thick and looks like it’s about to split (it will have a greasy sheen), whisk in a little warm water, then continue adding the butter. Season, then add the chopped tarragon. Taste and add lemon juice if needed. 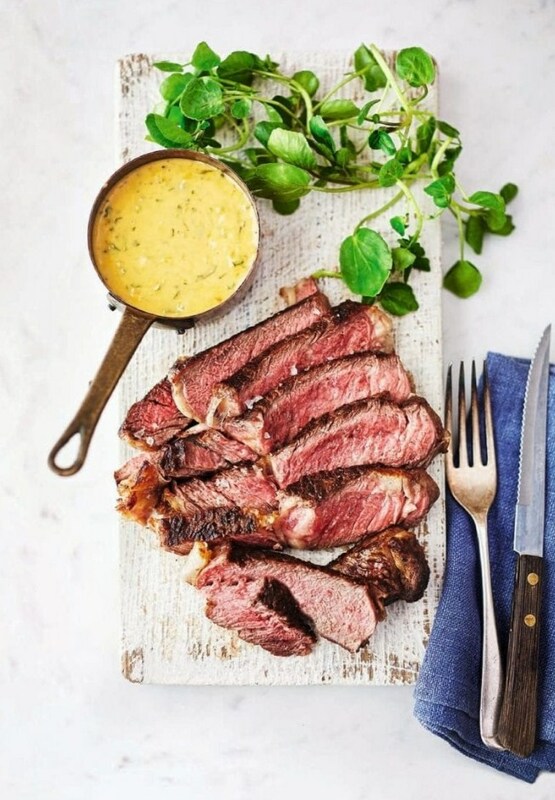 To keep the béarnaise warm while you cook the steaks, take the pan of water off the heat and put the bowl back on top with a piece of cling film touching the surface of the sauce. Put a griddle pan over a high heat until smoking hot. Brush the steaks lightly with oil and season. Griddle (you may need to do this one at a time) for 1½ minutes, then give them a quarter turn and cook for another 1½ minutes to get cross-hatched char lines. Turn over, then repeat. Transfer the steaks to a shallow roasting tin, then cook in the oven for 7-10 minutes for rare to medium- rare. Remove, cover with the butter wrapper or foil, then rest for 5 minutes. Cut into 2cm slices, then serve with the béarnaise, watercress and, if you like, chips. For best results, ask your butcher to cut you a 600g boneless rib-eye about 4cm thick. If the steak is thicker than that, bash it down gently with the flat of your hand until it’s the right thickness. Other cuts of steak are good with béarnaise, too. Onglet and rump steak are less expensive and still taste terrific. Look for steak that’s been dry-aged for at least 21 days and comes from British grass-fed cattle. Grass feeding gives the meat a better favour. Look for meat with a good marbling of fat – this gives it favour and helps keep the rib-eye moist during cooking. Go for a juicy pinot noir or fruity Italian valpolicella rather than a rich red.